I from Bailleul, north of France, next to Belgium. 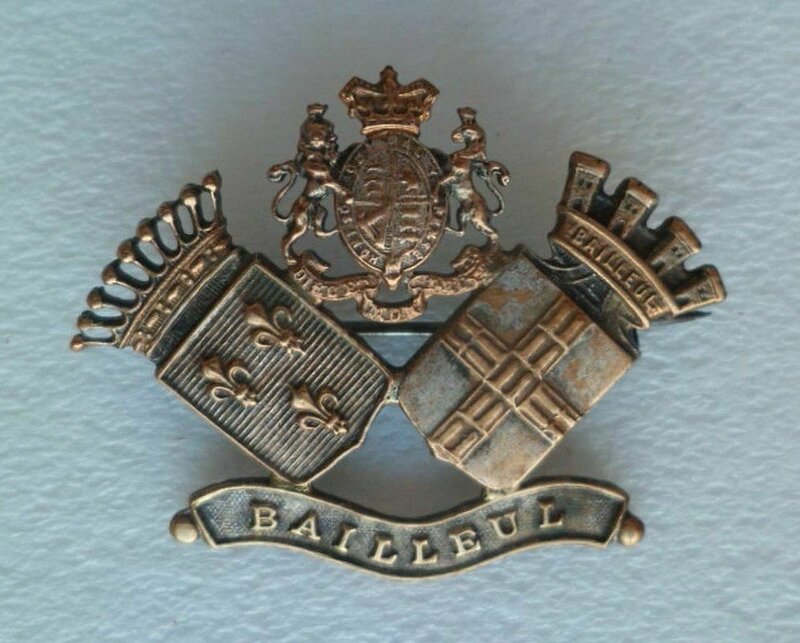 I am looking for information about a commemorative pin badge after the WW1. I posted a photo with this message. There are 3 symbols: 1 Bailleul City and 2 other British symbols. Do you have information that can help me identify? Surely the left hand shield is the coat of arms of France? having difficulty with the British coat of arms, the crown does not seem WW1 period kings crown. and queens is rounded not pointed. The crown is that seen on Victorian era general service buttons. I have one but my camera is not up to the job of getting a decent photo, but if you do an internet search for Victorian GS buttons you can see if you agree. Interests:Coldstream Guards, Durham Light Infantry, Royal Regiment of Artillery, Naval Artillery. Anything bright "n" shiny and goes bang. Just a thought. The shield on the right appears to be a close match for the arms of the commune of Bailleul. The shield on the left has the three fleurs de lys but is mounted with a crown. Could this suggest it is of the second empire era? (Ended 1870, apparently) All the post 1870 emblems seem to rely on Marianne, or have a fasces /axes combo. The shield on the left with three fleur de lys is similar to the arms of Anjou. The commemoration pin as a lot can be added to this conversation, if the back is seen.